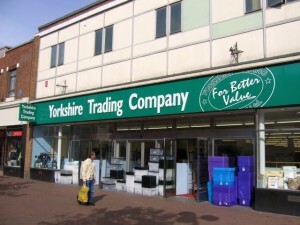 Stop one is High Street in Redcar, where the former Woolworths store has recently become a branch of the Yorkshire Trading Company. As always seems to be the case with old Woolies stores, it still looks and feels much like a Woolworths inside, and appears to sell a similar range of goods – homewares, gardening products, confectionery, and the like. However, when I visited there seemed to be a lot of empty shelf space left to fill, with some sections of the store not yet stocked at all. The shop’s highlight, however, is its surprising yet lovely view out to the sea from its back door – presumably something that few old Woolworths stores can boast. Next stop is Middlesbrough, where the Woolies branch in the town’s Hillstreet Shopping Centre is now occupied by another discount variety retailer, Waremart. This is another huge store, and again it felt to me that the stock was spread rather thinly to fill the space. 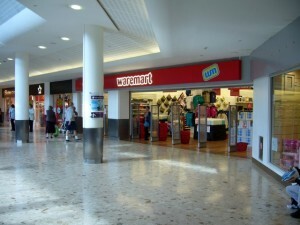 However, unlike the YTC shop in Redcar – which has reportedly signed a 15-year lease for the property, and has an air of permanence – Waremart has only, as yet, taken a temporary lease for the Middlesbrough site. Though the mallside fascia is pretty smart, the shop’s lack of permanence does comes across in its ‘pile it high’ instore feel. 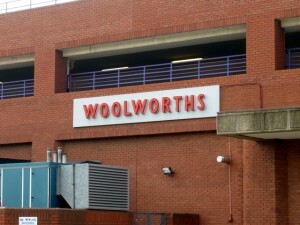 The fact that the Woolworths signs facing the service yard are still in place (below) is also a bit of a giveaway! Niggles aside, the Woolies stores in Redcar and Middlesbrough do at least have the benefit of being reoccupied – which is more than any of the others I saw today. 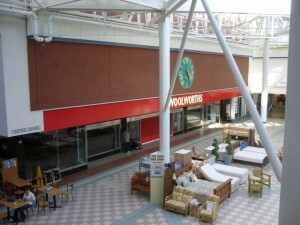 The old Woolworths at the third port of call – the Castlegate Shopping Centre in Stockton-on-Tees High Street – is decidely empty, with apparently little sign of anything happening. The same is true of the fourth stop, at Hartlepool’s Middleton Grange, where the two-storey former Woolies really leaves a big hole in the middle of the mall. The next call – at Houghton-le-Spring, near Sunderland – is a bit of a cheat, given that it’s a Woolworths passed only on the bus, without actually stopping. However, I did have a wander round Houghton-le-Spring less than a week ago, so it seems only fair to count it as Woolies number five. With its broken and boarded up first floor windows, this store is looking rather a mess – again, however, there appears to be no sign of anything imminent happening. The sixth and final stop is back home in Gateshead. If you were being uncharitable, you might claim that an empty shop is more in keeping with Gateshead town centre than an occupied one, given the unusually high rate of voids – a reported 60%. However, it’s difficult to judge how Gateshead is really faring given that a huge chunk of the town centre is currently being demolished as part of the Trinity Square redevelopment. There are positive signs, though – an independent ladies’ fashion shop has opened in the prominent former Leveys site opposite the bus station, while a pawnbroker is due to open in the corner unit of the former Co-op department store this coming Saturday… However, it’s difficult to see much happening with the Woolies site while the town centre is in redevelopment flux, unless Tesco chooses it for its temporary store over the smaller (but already acquired) old Kwik Save premises down the road. So, what does all this show? 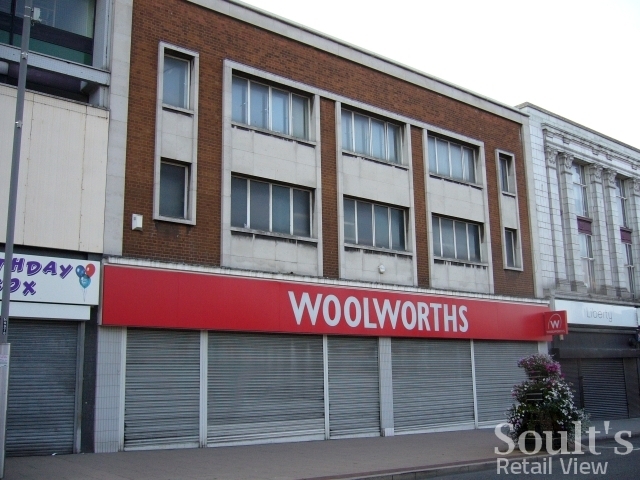 Certainly, it seems to mirror the UK picture in so far as a majority of former Woolworths stores remain empty. Similarly, it also echoes the way that many of those Woolworths that have been taken over are now occupied by value variety retailers – ironically, a niche that Woolworths could and should, in different circumstances, have carved for itself. Perhaps most importantly, it reminds us – if a reminder were needed – of just how ubiquitous Woolworths was in our high streets and shopping centres, and the gap that has been left by its departure; a gap that, as yet, has only been partially filled. Update – 14 October 2009: It looks like the store in Stockton has now been taken over by B&M Bargains. Next story Is Apple Store coming to Newcastle’s Eldon Square? That’s fascinating Gareth – many thanks! I’ll have to keep an eye out next time I visit Stockton and Middlesbrough again. Having been to Stockton and Middlesbrough,the former Woolworths stores you visited, were not the original stores in these towns. Firstly in Stockton, up until the opening of the Castle Centre, Woolworths was at the other end of the High Street between M&S and Debenhams, it is now a YMCA charity shop near the corner of what is left of Wellington Street. 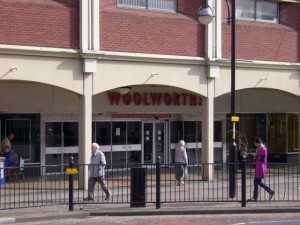 When Woolworths moved to the Castle Centre, the then North Eastern Co-Operative Society acquired the store to connect to their Wellington Street Department Store which gave them a some high street frontage. The store closed in the early 90s and sadly the impressive Wellington Street Building was demolished to make way for the bland Wellington Square Shopping development. In Middlesbrough the former Woolworths in the Hill Street centre was actually Woolworths’ fourth store in Middlesbrough. The first was on Linthorpe Road, opposite the Sony Centre. In the 1950s they moved a few doors up Linthorpe Road to a new Department Store, just before Binns corner. This was one of the many larger stores which had large food halls which closed in the early 80s when the British arm of the business was sold. This building was split into three separate units. 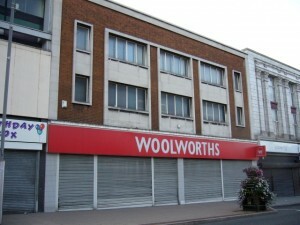 For a few years there was no Woolworths presence in Middlesbrough. Then in about 1990 there was a short-lived Woolworths Music & Video store in a corner unit diagonally opposite the store you visited. You may therefore have visited a further three former Woolworths. 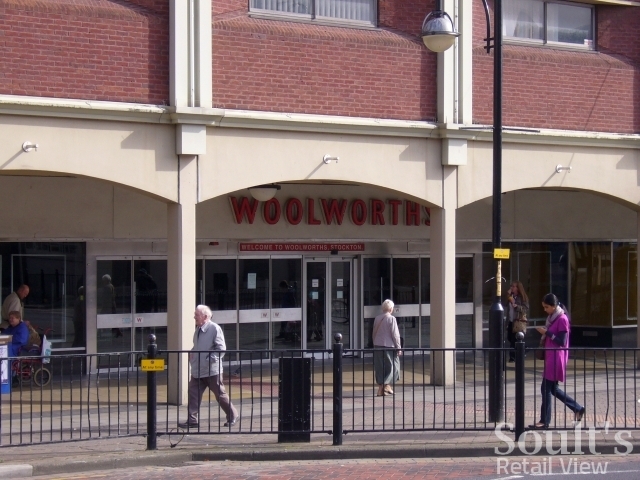 Soult's Retail View » Blog Archive » What’s become of North Yorkshire’s former Woolies?